The Apollo 13 mission was meant to be NASA's third trip to the moon. The American public, however, is losing interest in space exploration, starting to see moon landings as routine. This Apollo mission is about to catch the interest of everyone across the world when their ship malfunctions, changing the ultimate goal of goal from landing on the moon to simply making it home alive. 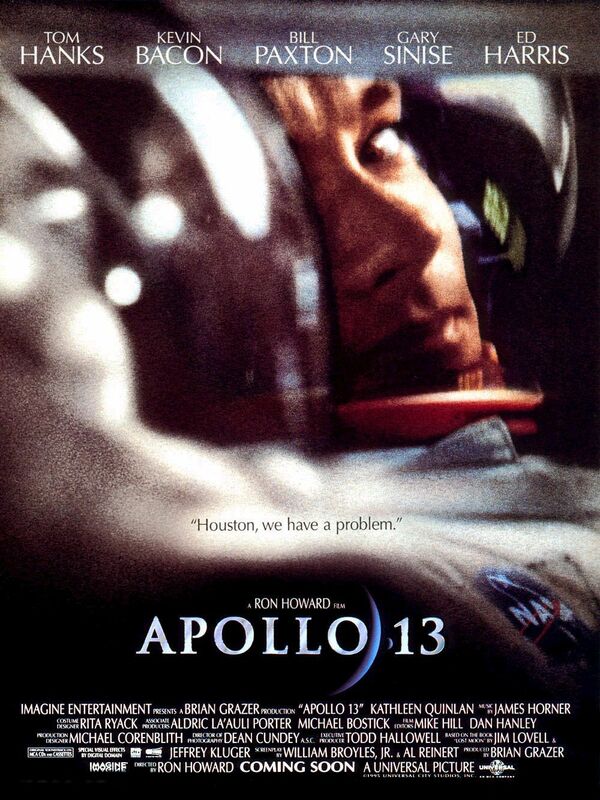 Based on a true story, Ron Howard's "Apollo 13" was nominated for nine Academy Awards, including Best Picture. Howard proves here, definitively, that he is capable of being a brilliant director when he puts his heart and soul into his work. He has slipped lately, which makes us sad because we typically love his work. Howard brings together an all-star, fantastic cast including Tom Hanks, Ed Harris, Bill Paxton, Kevin Bacon, and Gary Sinise, and does a stellar job of building up each character so as an audience, we feel connected to them and their cosmic plight. Hanks plays astronaut Jim Lovell, and though all the characters are integral to the story, the primary focus is on Jim and his family. Of course, Tom Hanks is fabulous because, let's face it, when is he not? Also wonderful is Kathleen Quinlan, who plays Jim's wife Marilyn in a performance that earned her a much deserved best supporting actress Oscars nomination. She has so many great moments in the film that draw an emotional response right out of us, from the times she remains strong for her kids to ordering camera crews off her lawn in the midst of sheer and utter chaos. She is not the only actor to receive a nomination from "Apollo 13." Ed Harris was also honored with a nomination for his performance as Gene Kranz, who runs the Apollo 13 mission from Houston. Harris offers up the commanding presence needed for this character, and we truly love Harris' hurried but straight-faced demeanor. The acting is really great across the board, from Sinise's portrayal of Ken Mattingly, who was banned from the Apollo 13 mission because of exposure to the measles but never actually had them, to Kevin Bacon's performance as Jack Swigert, who is the young buck of the group and the astronaut with the most groupies. Beyond this, the look of this film is truly outstanding. Howard and the other makers of this film were able to create wonderful zero-gravity environment by actually filming on NASA's KC-135, aka the "Vomit Comet," which does parabolic arcs to achieve weightlessness for about 25 seconds at a time. This allows the actors to have a realistic and breathtaking on-screen weightless in appearance, which sells the outer space aspect of the film. In addition, the "from space" shots are truly tremendous, and it's so obvious that Howard painstakingly researched the hell out of the subject. Audiences crave a mixture of drama, emotion, danger, and acting, and "Apollo 13" is able to quench all of those desired. It is a truly engrossing, emotional, action-packed, edge-of-you-seat experience, and one we love even to this day. One year ago, we were watching: "Jurassic Park"